In 2011, the documentary film The Dark Side of Chocolate by Danish journalist Miki Mistrati exposed how thousands of children from Eastern African countries were forced to work in the cocoa industry for chocolate multinationals. Seven years later, a new research released Friday in Brazil demonstrates how this is a widespread reality facing children on the other side of the Atlantic as well. At least 8,000 Brazilian children and teenagers currently work in the chocolate production chain, the report commissioned by the International Labor Organization (ILO) and Brazil’s Labor Prosecution Office showed. The survey was conducted in 2017 and 2018. Brazil is the world’s 7th and Latin America’s 2nd largest cocoa-producing country. The beans are grown in eight Brazilian states, and Pará, a northern state in the Brazilian Amazon, holds a 49.3 percent share of the country's cocoa production. Brasil de Fato spoke with Marques Casara, one of the researchers who conducted the survey released Friday. He reiterated how important it is to hold industries accountable for violations in their production chains. Brasil de Fato: How was the process to produce the report? Marques Casara: The report came about from a cooperation agreement signed between the International Labor Organization and [Brazil’s] Labor Prosecution Office aiming at a number of initiatives toward decent work in production chains, including the cocoa chain. And one of the steps of this agreement was to produce a research. I was hired by the ILO to conduct the survey because our organization specializes mainly in investigating the social and environmental impacts of production chains, as well as pointing out the higher links of this chain that are responsible for violating rights – as they are often not located where the violation is committed. They are in other states, other countries. We mapped this chain for a year and pinpointed the links throughout it. Our main finding is that child labor is a common practice at the base of the cocoa production chain. It directly benefits major cocoa processors based in Brazil that are connected with multinational corporations, as well as major food companies that market chocolate. Another important aspect in the research was finding [evidence of] fraud in sharecropping arrangements, where the farmer keeps half the yield and the owner of the land keeps the other half. What we have found is that this sharecropping process is an excuse to hide practices that violate rights, including slave labor. The third important thing is that there is an extensive network of middlemen who commit tax fraud and tax evasion and buy cocoa from farmers and then pass it over to big cocoa processors and big mills. In what sense do multinational companies benefit from child exploitation? Multinationals in the food and processing industries that manufacture chocolate directly benefit from child labor, because they buy cheaper products when [poor] families put their children to work on the harvesting and early cocoa processing stages, which happen in the property, in the cocoa bean fermentation process. What mills pay small farmers through middlemen is not enough for them to hire adults to help out with this work. So these farmers put their children to work and sell the cocoa to middlemen, who then hand it over to big companies. This business is absolutely outside the law, because they do not invoice it and comply with tax obligations. Who should be held responsible for changing this situation? The first responsibility lies with the cocoa and chocolate multinationals. If you visit these corporations’ websites and see what they claim to do regarding monitoring their production chain, if you look into the practices they claim to adopt, they actually do not adopt them. The sustainability and social responsibility reports of big multinationals in the food industry claim they do not tolerate slave labor or child labor in their production chains, arguing they have a number of protocols to tackle this issue. However, you can’t pinpoint where they monitor that, there is no data to measure the results or see the history of this monitoring through the production chain. So these reports are presented as facts, but they are actually letters of intent that cannot be proven at all. The government has responsibility to it, in the sense it has wrecked law enforcement agencies and drastically cut funds for law enforcement operations, and that makes it impossible for labor auditors and authorities to get out of their offices and go to the field to look into work conditions on-site. There are many places in Brazil today, Ministry of Labor offices, and auditors who don’t even have a computer. They have cars, but don’t have fuel. Sometimes, they don’t even have a car, they have to procure it from another city. So, as I see it, it’s an intentional management structure, which makes it impossible for authorities to follow the issue closely. Can we say all the chocolate in the market today is tainted by child labor? 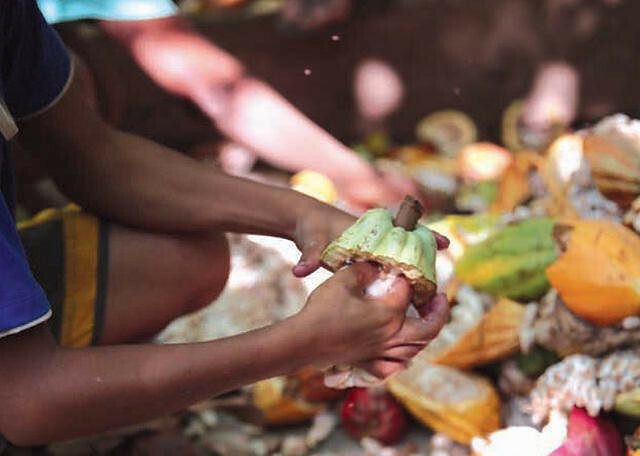 All the chocolate sold today in Brazil is tainted by child labor. That I can tell you for sure. Why? They don’t monitor where that cocoa is coming from, so you can’t even tell apart when it’s not exploiting child labor. The exceptions are some special chocolate brands where buyers do make sure to monitor their production chains, their sourcing process, and whether the properties [they buy from] commit human rights violations. But that is a tiny, tiny part of them. What stroke me the most was how these families are left uncared-for by the production chain that needs them to earn very substantial profits. A cocoa-producing family is the main actor in this chain and, at the same time, the main victim of a predatory, inhumane process that does not take into consideration people’s fundamental human rights. The situation is very serious. While the chocolate industry is highly profitable, producing cities have low levels of human development. Why is that? The cities where middlemen run warehouses collect tens of millions in taxes, while the cities where cocoa is actually produced don’t collect taxes at all. Why? With the middlemen, they don’t invoice operations and carry out fraudulent operations, and their goal is specifically to get the cocoa beans at the lowest possible cost. That’s where you get child labor, slave labor, poor work conditions in the operations these middlemen have to move the cocoa from these cities to where they process it to eventually move it into a productive chain where only big companies profit. The middleman controls the life and death of these cocoa-producing families. That’s because he serves big cocoa processors and his mission is not helping these families – his mission is to get the cocoa at the lowest possible cost. It’s a network of middlemen. You have small local middlemen who have their small trucks that take [the cocoa] to a warehouse, or the small farmer who takes it directly to it, and there are dozens in cocoa producing cities. And this small middlemen moves it to a bigger one. In Pará state, they take it to Altamira, and the bigger middleman takes it to big cocoa processors in southern Bahia state, where most of Brazil’s cocoa processing operations are based. So it’s very convenient for big processors and food companies to have these middlemen. And they are very oppressive from the point of view of the cocoa producing families. There are cases, for example, where small farmers trade cocoa for food. What’s the message for consumers, companies, and governments? Maybe big cocoa-producing companies, food companies, and chocolate manufacturers could claim they were not aware of these severe human rights violations in their production chains until last week, but that is not likely anymore. As this survey is out, big processors and chocolate brands have to give a strong answer to solve these unacceptable issues that have been going on in the cocoa and chocolate production chain.